At least 65 people were killed. 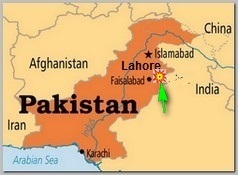 Many of whom women and children, and more than 200 injured when an apparent suicide bomb ripped through the parking lot of a crowded park in the Pakistani city of Lahore where Christians were celebrating Easter, on Sunday 03/27/2016 evening., officials said. The park had been particularly busy on Sunday evening due to the Easter holiday weekend. “The toll has risen to 56. The rescue operation is continuing,” Lahore top administration official Muhammad Usman told AFP. The blast occurred in the parking area of Gulshan-e-Iqbal Park, a few feet (meters) away from children’s swings. Around 150 people were injured in the explosion, officials said. There was no immediate claim of responsibility for the blast. Pakistan, a nuclear-armed nation of 190 million people, is plagued by a Taliban insurgency, criminal gangs and sectarian violence. Punjab is its biggest and wealthiest province. The park had been particularly busy on Sunday evening due to the Easter holiday weekend.